Well, I finished that last book, so now I'm reading one titled "Area 51". I enjoyed Great Loop Cruising, Back onto the cowboys for a while. Area 51....UFO's, aliens, secret weapons testing, etc. "The truth is out there". 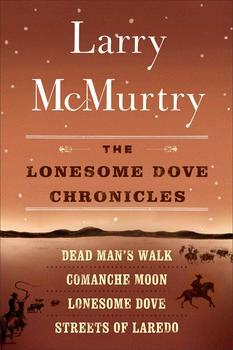 Into a new "Lonesome Dove"
This book is the complete four book version. I'ts gonna take some time getting though this one. The timeless, bestselling four-part epic that began with the Pulitzer Prize-winning Lonesome Dove takes readers into the lives of Augustus McCrae and Woodrow Call, two tough-as-nails Texas Rangers in the heyday of the Old West. As young Texas Rangers, Augustus McCrae and Woodrow Call--"Gus" and "Call" for short--have much to learn about survival in a land fraught with perils: not only the blazing heat and raging tornadoes, roiling rivers and merciless Indians, but also the deadly whims of soldiers. On their first expeditions--led by incompetent officers and accompanied by the robust, dauntless whore known as the Great Western--they will face death at the hands of the cunning Comanche war chief Buffalo Hump and the silent Apache Gomez. They will be astonished by the Mexican army. And Gus will meet the love of his life. Texas Rangers August McCrae and Woodrow Call, now in their middle years, are still figuring out how to deal with the ever-increasing tensions of adult life--Gus with his great love, Clara Forsythe, and Call with Maggie Tilton, the young whore who loves him--when they sign up to pursue the Comanche horse thief Kicking Wolf into Mexico. On this mission their captain, Inish Scull, is captured by the brutally cruel Mexican bandit Ahumado, and Gus and Call must come to the rescue, with the aid of new friends including Joshua Deets, Jake Spoon, and Pea Eye Parker, as well as the renowned Kickapoo tracker, Famous Shoes. Gus and Call, now retired from the Texas Rangers and settled in the border town of Lonesome Dove running the Hat Creek Cattle Company, are visited by their old friend Jake Spoon, who convinces Gus and Call to gather a herd of cattle and drive them north to Montana in order to start a cattle ranch in untouched territory. Gus is further motivated by a desire to see the love of his life, Clara Allen (nee Forsythe), who now lives with her children and comatose horse-trader husband in Ogallala, Nebraska. On the way to Montana they travel through wild country full of thieves, murderers, and a lifetime's worth of unforgettable adventure. Woodrow Call is back in Texas, a Ranger once again and a general gun-for-hire, but increasingly a relic as the westward sprawl of the railroads rapidly settles the once lawless frontier. Hired by a railroad tycoon to hunt down a dangerous bandit named Joey Garza, Call sets out once again with a hapless Yankee named Ned Brookshire who works for the railroad company that hired Call. Call's old friend Pea Eye Parker--who initially refused to join the expedition because of his family--sets off with the Kickapoo tracker Famous Shoes to try to catch up with Call, until he runs into troubles of his own. The long pursuit of Garza leads them all across the last wild stretches of the West into a hellhole known as Crow Town and, finally, into the vast, relentless plains of the Texas frontier. I saw the television versions of all of them. I still think it is one of the best westerns ever made (Lonesome Dove). eight hundred pages. The other three books aren't small either.